Many readers already have a gunsafe, but if you’re like most gunowners, your safe is completely filled with guns, scopes, and personal valuables. Wouldn’t it be nice to have additional secure storage for items such as shooting rests, barrels, tripods, and expensive tools? Here’s a useful item that can safeguard your tools, outdoor gear, and shooting accessories. In a pinch, it can augment the storage capacity of your gun safe, though we recommend a conventional gun safe with UL-rated locking mechanism for long-term firearms storage. 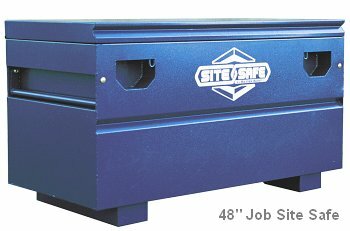 The Better Built® 48″ Steel Job Site Safe is now on sale at Lowe’s for $249.00, marked down from $288.00. Offering 17.5 cubic feet of storage space, the Site Safe (Lowe’s item # 195894) will hold tools, barrels, tripods etc. up to 48″ in length. It is 25″ high, 24″ front to back, and is built of powder-coated 14 gauge steel. The design includes recessed lift handles to assist in installation. In the front are two lock ports which can be secured with padlocks. This unit can be very handy in your garage or workshop to secure expensive tools and other equipment. Also, its low, horizontal design allows it to fit in places where a conventional, vertical style safe will not fit. Better Built® also offers 36″-wide (item 37224145), and 60″-wide (item 37224142) Site Safes, but these products are not currently sold at Lowe’s. Share the post "Lock Up Your Tools and Shooting Accessories in Job Site Safe"